pfSense is an open source distribution of FreeBSD-based firewall which provides a platform for flexible and powerful routing and firewalling. The versatility of pfSense presents us with a wide array of configuration options which, compared to other offerings, makes determining requirements a little more difficult and a lot more important. Through this book, you will see that pfSense offers numerous other alternatives to fit any environment's security needs. 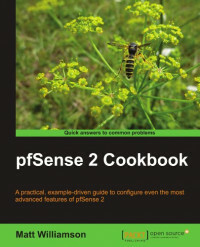 This book follows a cookbook style to teach you how to use the features available with pfSense after determining your environment's security requirements. It covers everything from initial configuration of your network interfaces and pfSense services such as DHCP and Dynamic DNS to complex techniques to enable failover and load-balancing. This book is written in a cookbook style. Each chapter consists of recipes, each of which is composed of step-by-step instructions to complete a particular task. Each recipe also includes tips, alternatives, and references to other recipes or appropriate external sources. The book can be explored chapter by chapter or in no particular order. This book is intended for all levels of network administrators. If you are an advanced user of pfSense, then you can flip to a particular recipe and quickly accomplish the task at hand, while if you are new to pfSense, you can read chapter by chapter and learn all of the features of the system from the ground up. Use your $25 Google AdWords credit to start boosting your bottom line today!